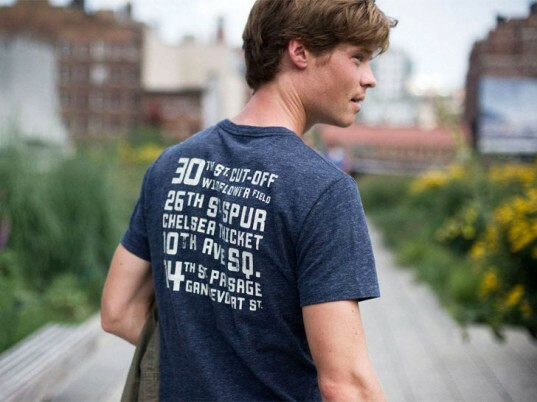 Looks like J.Crew wants to be BFFs with Friends of the High Line. As part of its "Garments for Good" initiative, the high-street retailer has designed a limited collection of clothing and accessories in support of New York City's elevated-railway-turned-public-park. The designs, which include sweatshirts, tees, tote bags, friendship bracelets, and baby onesies, feature custom graphics based on vintage depictions of freight trains, the botanical art of George Olson, and illustrations from The Curious Garden by children's author Peter Brown. Writing on its website, J.Crew describes the High Line as one its favorite “happy places,” but it wasn’t always so. The once-abandoned structure, which historically transported freight up and down Manhattan’s West Side, was originally slated for demolition. A group of community residents saw potential hidden among the ruins, however. After a hard-won battle for its preservation, the first phase of the rehabilitated pedastrian walkway opened in 2009, running from Gansevoort Street in the Meatpacking District to West 20th. 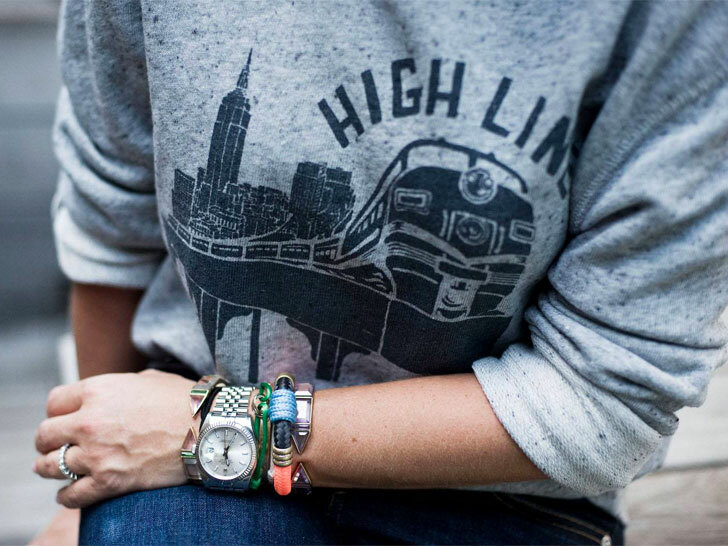 100 percent of the net proceeds from J.Crew’s “High Line” capsule will go to the Friends of the High Line. The Friends of the High Line, now a bonafide nonprofit conservancy, continues to maintain and operate the park for the city, but not without considerable financial overhead. To help sustain the park, 100 percent of the net proceeds from J.Crew’s “High Line” capsule will go toward the conservation and maintenance of the space. More’s the pity then, that the J.Crew for High Line collection wasn’t made in New York City, or at least the United States. At a time when domestic manufacturing is floundering, a locally produced line would have made for some resonant symmetry. The once-abandoned structure, which historically transported freight up and down Manhattan's West Side, was originally slated for demolition. A group of community residents saw potential hidden among the ruins, however. After a hard-won battle for its preservation, the first phase of the rehabilitated pedastrian walkway opened in 2009, running from Gansevoort Street in the Meatpacking District to West 20th. The Friends of the High Line is now a bonafide nonprofit conservancy. It continues to maintain and operate the park for the city, but not without considerable financial overhead. To help sustain the park, 100 percent of the net proceeds from J.Crew's "High Line" capsule will go toward the conservation and maintenance of the space. More's the pity then, that the J.Crew for High Line collection wasn't made in New York City, or at least the United States. At a time when domestic manufacturing is floundering, a locally produced line would have made for some resonant symmetry. The High Line is operating on its summer schedule, with the park open daily from 7 a.m. to 11 p.m.
You can purchase J.Crew collection online at www.jcrew.com and shop.highline.org, as well as in person at the High Line Shop on West 16th Street. Items will also be stocked at select J.Crew stores in NYC. Prices range from $15 to $78.